It is outrageous that the EU may scrap legislation that requires eggs and egg boxes to be labeled according to farming methods. All eggs ought to be free-range - and this proposal would restrict consumers ability to know what they are buying. Compassion in World Farming (CiWF) has recently reported that the EU Commission is discussing the possibility of repealing the current law. This requires battery eggs to be labeled as "eggs from caged hens" - legislation that CiWF and many supporters of higher welfare standards fought so hard to bring about. As a lifelong campaigner for better treatment for animals, I am concerned that this excellent law, which has been an important contributing factor in the decline in demand for 'battery' eggs, is under threat. It is a disgrace that international agribusiness wants to scrap this law just so that it is easier for them to profit from animal suffering. I pledge that if I am elected to the European Parliament here in the East of England I will oppose this threat to EU labeling law - law that is essential in providing the consumer with the necessary information needed to make a considered, moral choice. I will also support the proposed ban on battery cages due to come into force in 2012 - there should be no delay in implementation. "Green politics is clean politics, and by signing up to this pledge we are inviting the public to hold us to these high standards. We will now be asking the candidates from the other political parties to sign up to the same pledge: their choice as to whether or not to do this will reveal how serious they are about cleaning up politics." And any Party member / candidate found to be evading or breaking this pledge will be subject to our Party's disciplinary procedures. Go 39 minutes in to see Rupert Read debating government minister Chris Mole live on Sunday's BBC Politics Show (link expires May 3rd). Up to 200 people attended a meeting on Thursday night in central Cambridge, with two of the country’s best known green campaigners, who helped to launch the Green Party’s Eastern Region Euro Election campaign. Sir Jonathan Porritt, Chair of the Sustainable Development Commission and Tony Juniper (1), recent Executive Director of Friends of the Earth were speaking in Cambridge and joined Lead Eastern Region candidate Dr. Rupert Read and local members and supporters for the launch (attached images - please use with copyright credited to Ronald Eva). Jonathon Porritt and Tony Juniper talked about the need to change the whole way we operate and look at the world. 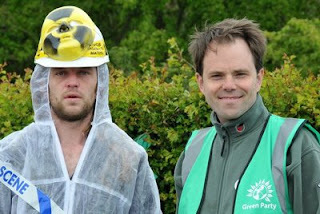 Both backed Rupert Read for the European elections on June 4th and encouraged people to get actively involved with Green politics whatever their background. Tony Juniper stressed the need for those who are involved with NGO's or communities groups to take the batton to the polling stations and VOTE GREEN. Juniper stressed that social justice was a key part of the policy towards a Greener economy. 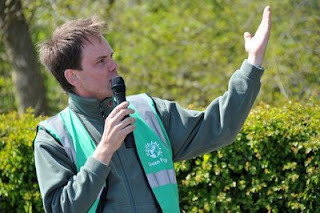 He gave the example of the the Green breakthrough in Cambridge in 2008 in Abbey ward, when Margaret Wright was elected and where voters turned to the Greens for change and improvement, both social and environmental. Jonathon Porritt described his view that western society was trapped in an unending cycle of work and consummerism. He went on to comment on the Budget, doubting the economy would grow again in 2010. He urged voters to break this trap, and said that by Voting Green people could vote for a happier and cleaner world. 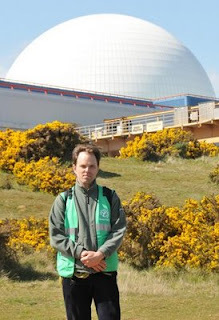 Green Party Prospective MEP for Eastern England Rupert Read will be joining campaigners at the Sizewell nuclear power site tomorrow (25th April) to call for investment in renewable energy and to oppose £ billions being sunk into more nuclear stations in East Anglia. The Green Party has consistently opposed nuclear power due to its cost, the unsolved issues of how to deal with radioactive wastes and the risks of catastrophic releases of radiation, due to accidents or terrorism. More recently, concerns have grown about flooding risks to coastal nuclear power stations as sea levels rise due to climate change. Scientists believe that sea level rise could exceed previous forecasts. Two sites have been earmarked for possible new nuclear stations in East Anglia - Sizewell in Suffolk and Bradwell in Essex. 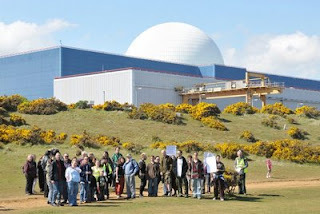 Campaigners will gather at Sizewell A and B on Saturday 25th April at 12 noon. Rupert Read is one of the speakers on the day. There will also be a camp overnight, in preparation for a vigil on the morning of 26th April, Chernobyl Day, to remember all those who have been affected by the 1986 disaster. Green Party Campaign Launch - Juniper, Read & Porritt! The Labour government today missed a golden opportunity to create huge numbers of jobs in emerging industries, says the Green Party. Dr Caroline Lucas MEP, the Green Party's leader, told Radio 4's The World at One today that the government is throwing away the potential to create hundreds of thousands of extra jobs by failing to invest adequately in insulating buildings, in solar energy and other renewables, in upgrading the electricity grid, in public transport and in new skills training. Britain is lagging behind other countries in the "greenness" of its so-called "green stimulus" plan, she said - against the advice of its own advisors. Dr Lucas pointed out that the government's own watchdog, the Sustainable Development Commission, (SDC) had proposed a £30bn package very similar to the Green Party's Budget proposals - and which SDC calculated would create 800,000 jobs. She described the chancellor's "green stimulus" as "one-tenth or less of what it should be" if the UK were to meet serious emissions targets and maximise the job-creation potential of sectors like energy, where renewables sustain far more jobs per megawatt than either nuclear or coal. On scrappage, Caroline Lucas disagreed that this would create significant numbers of jobs, but proposed a better way forward. She said the way to go was to build cars to last, and refit and improve them over time - which would reduce the associated energy while significantly increasing the amount of labour involved, by comparison with new manufacture. "The Chancellor talked bravely about low carbon technologies, but as usual, the detail of his proposals dont square up. More money for "clean coal" means less money for renewable energy investment here in Eastern England. The money allocated for offshore wind is welcome, but totally insufficient. This budget therefore involves another mis-allocation of resources, missing the huge open goal that the Greens keep pointing to: the chance to generate lots of sustainable jobs - and particularly right here in our part of the country." "The breath-taking levels of borrowing and debt announced by the Chancellor come about of course as a direct result of the abject faulure to regulate the financial industry which for many years binged on dodgy deals and encouraged unrestrained credit. The danger in the next few years is that the level of government debt and borrowing is so high, that economic policies become focussed only on tackling that debt, leading to swinging cuts in essential public servcies and cuts in much needed green investment. "On June 4th, voters have an opportunity to send a strong message to the politicians who have got us into this mess, and we would encourage them to exercise this by voting Green." Far too little, needs to be 10 to 15 times as much. Shows folly of building public finances to rely on growth. Need to get to a stable economy. £9bn to come from Gershon type public sector efficiency savings by 2014. NAO has cast considerable doubt on how real previous attempts have been. Actually a way to hide real cuts in services. Not enough. And only £100m on council houses. £2000 subsidy for a new car if car over ten years old is scrapped. Doesn't help environment, much of carbon cost of car is in manufacture. We need cars to last longer. Far cheaper and more effective way to cut carbon and help everyone is public transport. Average public sector pension is only £3000, reflecting poor pay. We want to see better pensions for all, and the foundation is a better state pension which the Green Party would set at £165 a week. Greens did this in 2007! And we need 10% annual cuts, not 1-2%. Money for Carbon Capture and Storage demonstration projects. Untried technology, will arrive too late. We need things that work now like insulation, wind, solar. Higher rate tax relief on pensions removed for those above £150,000. Welcome - this is existing Green Party policy. 50% tax rate for incomes above £150,000. Welcome, but only a start. £1.7bn extra help for jobseekers. But only £250m for training. Help with finding a job no good if there are no jobs to find. Training though is a useful way for unemployed people to spend time when jobs are short. Incentives to get more oil from the North Sea. Bizarre when we want to cut carbon. How on Earth does this government intend to pay off its debt, given that it has now missed its chance to implement a real Green New Deal?? 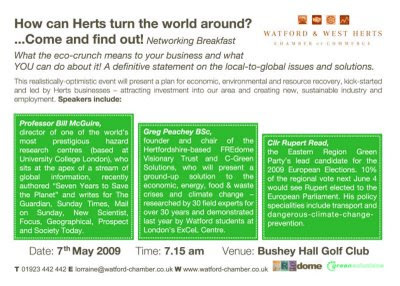 Rupert Read, the lead Green Party for MEP in the Eastern Region in the 4 June 2009 Euro-elections, undertook a tour of Bedfordshire earlier this month, and will be doing the same early next month. Having visited Leighton Buzzard as part of this tour, Read has praised the efforts of Bedfordshire County Council and the Town Council in their successful bid to secure over £1 million of funding for Leighton Linslade to become Bedfordshire's first cycling town. The Leighton-Linslade Cycling Team will focus on the challenging target of an overall doubling of cycling. They plan to increase the number of children regularly cycling to school from 1.2% to 3.5%, increase the number of commuters regularly cycling to the train station from 50 to 150, double the number of people who cycle to the town centre and double the number of cyclists using key routes, measured across eight key locations. "This project really is a fine example of good transport policy. Cycling is good not only for the environment, but for our health too. If this scheme achieves its target of doubling cycling in the area, the quality of people's lives in the area will improve. We know that the health benefits outweigh the dangers of cycling tenfold, and that cycling regularly reduces the risk of heart disease, strokes and increases the length of people's lives. And schemes like this will dramatically reduce the dangers of cycling so everyone's a winner!" "If elected as MEP for the Eastern Region, I will promote policies that will create more localised schemes like the Leighton-Linslade model here. I would oppose new road building schemes and mass-continent crossing proposals, and instead push for massive investment in walking and cycling (nad public transport) schemes that can be maintained over the long-term". Burgh Castle (near Great Yarmouth) on the morning of Thursday 23 April. students from the college doing different activities like art classes. 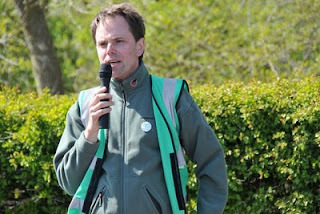 "Voters losing faith in UKIP"
Rupert Read, the Lead European Election candidate for the Green Party in Eastern Region has today raised his concerns about the performance and behaviour of UKIP since the election of their MEPs in the region in 2004. Former Bedfordshire based UKIP MEP Tom Wise and a researcher have both been charged with one count of false accounting and one count of money laundering (1) from the period when Wise was a UKIP MEP. He now sits as an Independent MEP. Rupert Read has also raised questions as to the effectiveness of UKIP since the last elections in 2004 in representing their constituents. "UKIP got two MEPs elected in 2004 here in Eastern Region on a platform that included preventing abuses of taxpayers' money in the E.U. The matter for which Mr. Wise has now being charged is abusing E.U. taxpayers' money while a UKIP MEP. According to an article in THE TIMES newspaper (2), Mr. Wise has already admitted embezzling money and using it to buy himself a new car". "I have been touring the region now for several months as part of the campaign for this year's elections and the message I am hearing from voters is that they have lost faith in UKIP. The Green Party offers a much more positive alternative to voters in this region who dont want to vote for the establishment parties. Green MEPs have been shown to be consistently hard working and committed to the policies they were elected on. If elected I am determined to uphold high standards in office and to be effective as a representative." Along the way, candidates and supporters joined at many more towns including Luton, St. Albans, Bedford, Stowmarket, Ipswich, Witham and Chelmsford. The plan was to visit up to 50 stations on 7 routes, with supporters joining up along the way - a "snowball" effect as more and more supporters joined in the fun on the way to London. GREENS' EURO ELECTION CAMPAIGN KICKS OFF! Two of the country's best known green campaigners will help to launch the Green Party's Eastern Region Euro Election campaign in Cambridge on Thursday 23rd April at 7pm outside the Senate House in central Cambridge. 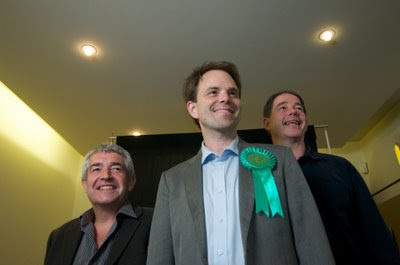 Sir Jonathan Porritt, Chair of the Sustainable Development Commission and Tony Juniper (1), recent Executive Director of Friends of the Earth will be heading up the endorsement of Dr. Rupert Read and the six other candidates on the Green Party's list for the Euro Elections on June 4th. "All the parties seem to be trying to paint themselves with a green gloss, but its a thin veneer to try and cover their unsustainable business-as-usual policies. The Green Party has consistently put forward a vision of a genuinely sustainable future over many decades. It is welcome, and significant, that two of the most respected green spokespersons in the country see in the Greens a party that has both the vision and the policies to deliver a green economy, to actually improve the environment and the quality of life for people." "I have been heavily involved in putting together the Green New Deal programme. If we are to have a vibrant, fair and environmentally economy to take the country forward we have to have politicians, in Brussels, in Westminster, in local councils who look beyond the next opinion poll, think of more than their own personal prospects and see that public office makes one responsible for the future of our children and our childrens' children. That's why Jonathon and I are here today." The launch and associated activity starts at 7pm outside the Senate House in central Cambridge on Thursday 23rd April. There will be an important announcement made about the nature of the Green Party's campaign in Eastern Region, at this time. A British member of the European Parliament has been charged with false accounting and money laundering. Tom Wise, 60, from Leighton Buzzard in Bedfordshire, was elected for UKIP in 2004 but is now sitting as an Independent MEP for East Anglia. The Crown Prosecution Service (CPS) said the UK police inquiry followed a news report in 2005 concerning Mr Wise's use of allowances. The MEP has been charged along with his then researcher Lindsay Jenkins. Both are accused of one count of false accounting and one count of money laundering. The offences are alleged to have taken place between October 2004 and September 2005. Derek Frame, from the CPS, said: "Following the publication of a news article in October 2005 relating to Mr Wise and Ms Jenkins, the European Anti-Fraud Office (OLAF) began an investigation into Mr Wise's use of allowances. "OLAF subsequently passed the investigation to Bedfordshire Police Economic Crime Unit for investigation. " Mr Wise, who represents Suffolk, Essex, Norfolk, Cambridgeshire, Bedfordshire and Hertfordshire, is one of seven MEPs who cover the eastern region. He was unavailable to comment on the matter. Mr Wise and Ms Jenkins are due to appear at Westminster Magistrates' Court on 27 April. Following the assessment period, sites that are "found to be suitable for the development of new nuclear power stations" will be listed in a draft Nuclear National Policy statement. 1. 2. 3. Rupert's Read: April 2009 4. 12. 15. 18. 19.